Budget Dumpster is not one to be afraid of a long term commitment. 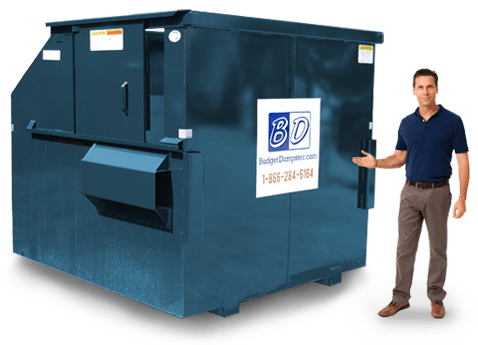 We can provide permanent dumpster rentals in Greenville to many different types of businesses. Our easy to understand service agreement and all-inclusive prices make our rental service the best in the business. 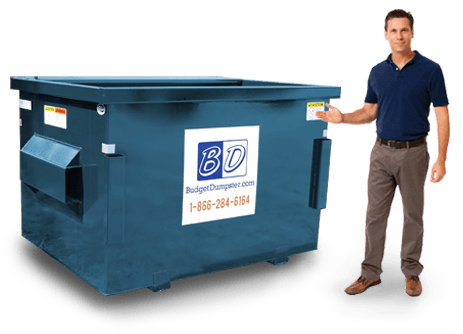 We offer a wide variety of dumpster rentals. No matter what type of waste removal you need, we can help. We understand that trash is messy and odd to talk about it but we are trained and very knowledgeable in this industry. Let us work with you to provide the waste removal your business wants and needs. Our commitment to our customers goes above and beyond. Let us handle all the stress of your weekly trash pickup. 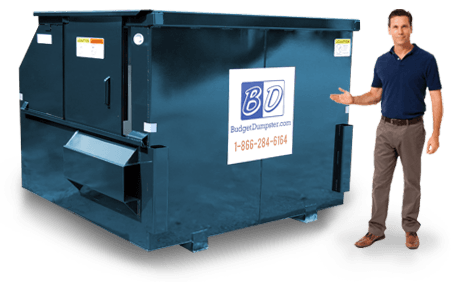 When you choose Budget Dumpster in Greenville, you won't have to fret about your trash getting picked up because we are reliable and experienced. Our drivers and sales staff have been fully trained to handle any possible situation that could arise. We have been in business for over 10 years and we want it to stay that way. Help us help you, by calling into our customer service center today. Our customer sales representatives will walk you through the entire process and explain how much it will cost and what our prices and services include. Feel free to ask questions and voice your concerns, we want to make this aspect of your business as simple and stress-free as possible. Our 2 yard dumpster is a great option for small businesses occupying less than 2,500 square feet of space. This size container is a breeze to fill with its three foot high walls. Don't be fooled by its small demeanor, the 2 yarders can handle the equivalent of a 1 ton pickup truck. This size dumpster is usually used for small restaurants and office spaces. It is a great size for those with limited space on the property for the placement of a container. The 2 yard dumpster is the most economical choice for businesses and retailers with minimal loads of trash. 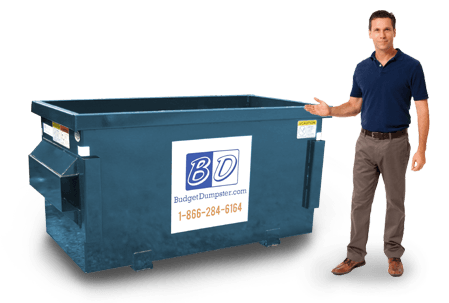 If you own your own small business, let Budget Dumpster handle your trash removal with a 2 yard waste container. Our 4 yard dumpster is a great in-between size. It offers twice the capacity of our 2 yard container but it doesn't take up that much more space. It has a width of only 6 feet and a length of 4 feet. It is easy to toss your trash inside the container since the walls are only 4 and a half feet high. This size container works best for small retailers, medium sized restaurants, and office buildings of 5,000 square feet or less. The 4 yard dumpster can fit in almost any parking lot and is a great choice for the business without a whole lot of space, but a good amount of trash. The 6 yard dumpster is the all-around size waste container. This is the typical dumpster found behind every shopping plaza or office park. The 6 yarder is the most popular because of its ability to fit in most parking lots and it can hold up to 1400 pounds of trash. This dumpster is very easy to load due to its easily accessible sliding door. If you are not a big fan of heaping trash bags up and over into the dumpster, you can just open the door and toss everything right inside. Our 6 yard dumpster is a popular choice among grocery stores, hotels, apartment complexes and much more. Our largest commercial dumpster is our 8 yard dumpster. This size container is not one you are likely to find behind any small business or retailer. Our 8 yard dumpster is great for warehouses and any type or large commercial business. This dumpster is about 7 feet tall and easily accessible with a sliding door. To fill the container, simply open the door and throw in your trash, it's as easy as that. If you know you have a large amount of trash on a weekly basis, the 8 yard dumpster is the way to go.